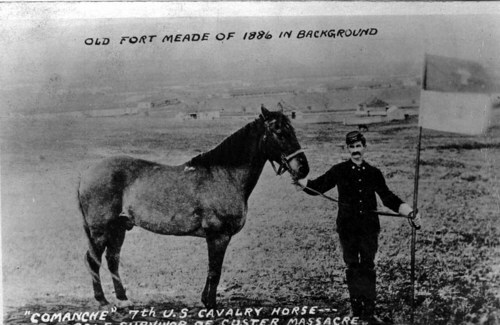 This black and white photograph shows a member of the 7th U. S. Cavalry holding the reins of the famous war horse "Comanche" and the 7th U. S. Cavalry flag at Old Fort Meade near Sturgis, South Dakota. Comanche was ridden by Colonel Miles Keogh at the Battle of the Little Big Horn in late June 1876 in Montana. One of many 7th U. S. Cavalry horses to survive the battle, Comanche was found two days later very badly wounded and barely able to stand. He was nursed back to health and was officially retired for life with special honors, as a living relic of that terrible struggle. Comanche died at Fort Riley, Kansas in 1890.